What we really need to do on Monday the 30th of July is drive from Moncton in New Brunswick to Nova Scotia. Originally, we were heading for Cape Breton, which is about 500 km away. In practical terms, this is a very long day's drive and I started looking for interesting places that might make it fun. To be honest, there is a lot of long, flat highway around this part of the world. And then, something strange happened and it turned out we were going to Prince Edward Island for the day. Perhaps I should explain. The first - no, almost the only - 'interesting place' I discovered was the 12.9 km long Confederation Bridge, which I thought could be viewed quite nicely from the Cape Jourimain Nature Centre. Of course it was a little bit out of the way, and there would certainly be the temptation to drive across once we got there. And then we'd be on Prince Edward Island. Well, no matter. We'd just have to figure out how to leave, and it turns out there is a ferry at the other end. At this point, crossing PEI to the ferry would be as good a route as any (though of course, it comes at the cost of a ferry ticket). 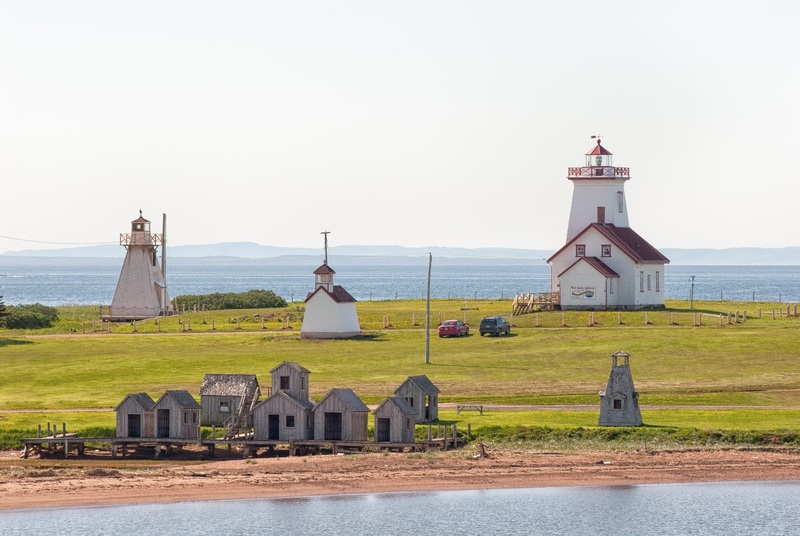 As I realized how different the landscapes of PEI are from those of New Brunswick, and above all, once I realized that Charlottetown would be an interesting place to visit, I became increasingly keen on this solution. 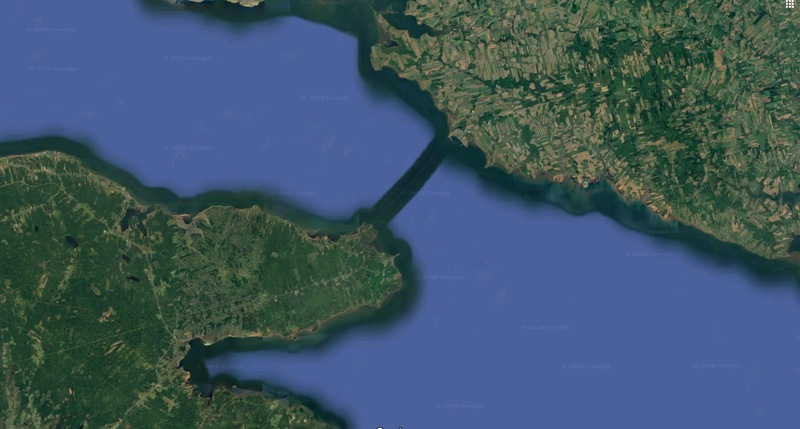 From Google Maps: the area around the Confederation Bridge shows the striking difference between New Brunswick and Prince Edward Island. PEI is densely farmed, but it's small field farming, not quite like in Europe, but perhaps a more similar feel. This difference runs through the whole of these two provinces. There was just one problem: the distance wouldn't be significantly greater, but the time taken, what with the ferry and all, would be much longer. It would be a lot of fun, but I just didn't see how we would have time to do all that touring in the morning AND make Cape Breton the same evening. Then a few nights ago, I woke up at about 3 am in possession of a brainwave. 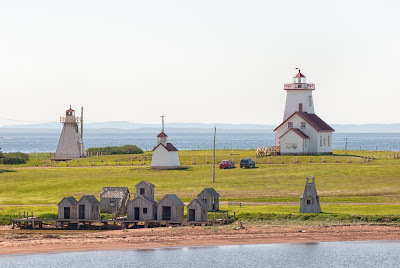 Once I accepted that we wouldn't be going all the way to Cape Breton on the 30th, I not only got a very nice day in PEI out of it, I was able to rationalize several parts of the next few days' driving and sight-seeing which had been bothering me. Let me explain why I was bothered. This itinerary of ours is based on one offered by a tour company which we liked but found we could DIY for less than half the price. And it's only when you begin figuring out for yourself where the rubber hits the road (literally, in this case) that you realize all the things that tour operators don't quite tell you. In this case, I realized that when they said they were going to show you Nova Scotia, they meant from the window of a moving vehicle, with very little stopping time. I already added a day to this part of the trip, and now I realize that it's barely enough. But I think I've made it work. Extra note: Prince Edward Island is where Anne of Green Gables is from. I have never read Anne of Green Gables, but of course I've heard of it. Maybe I'll watch the anime version! The road trip segment through Prince Edward Island, with approximate times. From Wikipedia: Wood Islands Lighthouse. Maybe we'll find out what the tiny village in the foreground is??? 7.00 - Our breakfast at the hotel is included, then we pack and check out. 11.00 - 12.00 - Drive from Confederation Bridge to Charlotte Town: allow 1 hour, 70.1 km. There are several multi-story car parks in Charlotte Town, called parkades. Queen Parkade may suit us best. 12.00 - 14.30 - Visit Charlotte Town, making sure to see Victoria Row, Confederation Landing and the harbor area. There are apparently many good seafood restaurants where we should get lunch. Oysters, lobsters, that sort of thing. Also, note that all the times so far are estimates, but we will have to leave in time to catch the ferry. If we arrive in Charlotte Town earlier than planned, so much the better. If it is raining, the Confederation Center of the Arts could be interesting. 14.30 - 15.30 - Drive from Charlotte Town to Wood Islands ferry crossing: 45 minutes but allowing 1 hour for safety, 52 km. NOTE TO SELF: All the times after this are estimates, based on last year's ferry schedule. This year's is not available yet. Review this plan when the schedule becomes available and make ferry reservations. 15.30 - 16.30 - We need to allow one hour waiting time for ferry, but the harbor and nearby Wood Islands Lighthouse look photogenic. It seems like a pleasant place to hang out. 17.45 - 19.15 - Drive from Caribou to Port Hawkesbury: allow one hour, 30 minutes, 137 km. At this point, we will JUST have made it to Nova Scotia! And we really do need to get at least that far. NOTE TO SELF: E-mail the hotel nearer the time and warn them that we will be checking in a little after 19.00. Dinner - there are several restaurants not far from where we're staying, but I'm not sure they're anything very special. If we've had a big lunch and are tired it may be more convenient for us to self-cater. Our hotel has a kitchenette, which presumably means at least a microwave. If we plan to use it, well... there are supermarkets not too far away, but it might be nice to show up with what we need - either left-overs from lunch or something else we acquired in Charlotte Town.